How are you digging that new Poptropica map? I love being able to see my progress on every Island. Look how close I am to the end of Vampire's Curse Island! I really need to sink my teeth into that one. Before you ask, though, I restarted Red Dragon and that's why my progress bar is so low on that one. It's not because I find ninja training to be such a challenge. No sir. Not at all. What Islands are you nearly finished with? 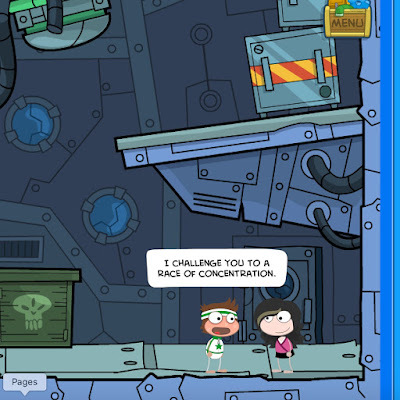 Try the new map on Poptropica to find out! This week, we released a major new update to the Poptropica travel map. It's so massive, we'll need several paragraphs just to describe all the helpful new features. The first thing you'll notice is a progress bar under every Island. This handy little guy will let you know how far you've made it in each Island, and how close you are to the end! Navigation is easier now, too. With over 40 Islands to explore, you need to be able to get from page to page as quickly as possible. That's why there are eight circular buttons at the bottom of the map that will allow you to jump instantly to whatever page you want. We've also re-ordered the Islands. Rather than putting the Islands in the order they were released, we've looked at which ones Poptropicans play the most. Those are now grouped near the front, so that you can get to them more easily. You'll also notice that all of the Island icons are now in color! Hooray! Clicking on an Island will also show you a little more information about it. You'll see your progress bar in a bigger size, as well as a short description and an option to restart the Island. If you've finished the quest more than once, we'll keep track of that number here too. Most helpful, this screen shows you how difficult the Island is. One skull & crossbones means the Island is easy, two means a moderate challenge, and three means be careful! One last note about this release: upon logging in, you'll now skip past the welcome back page and go directly to the Home Island. You can still return to your Island adventure with a single click, by selecting the icon beneath the bridge, as you see above. Don't worry, your friends profile and the Store haven't gone anywhere. You can get to them through the inventory menu in the top-right corner of the screen. New pop quizzes have been moved to your own profile page -- unless you've answered them all, you'll still get a new one every day! We hope these changes make Poptropica more fun and easier to use. We would love to know what you think about them, so don't be shy! You know how to reach us. Our last Feats of Speed game is on Poptropica now! The final Feats of Speed racing game is now on Poptropica! Find Speedy Sam on his trusty treadmill on the Home Island and race him through the Galactic Hot Dogs ghost ship. SPOOKY! Beat the world record and earn your emerald green sneakers. But be sure to get your shoes as soon as you can -- this race is only on Poptropica until next week. Over on the Poptropica app, Feats of Speed game 3 is now available. 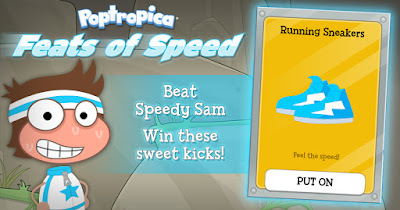 Race Sam up Mocktropica Mountain and get your Poptropican their blue sneakers. Same deal as Poptropica.com -- the race is only on the app for a week. 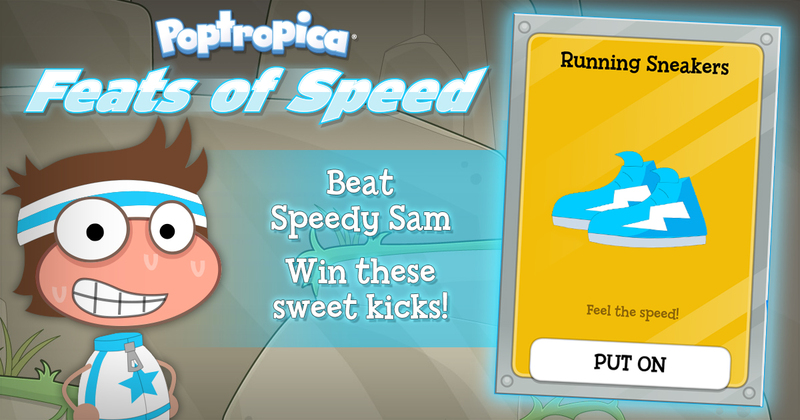 So zoom over to the Poptropica app, leave Sam in the dust, and grab those blue kicks! Are you ready, Poptropicans? Take some nice deep breaths and then get racing on Poptropica or on the Poptropica app! Get 150 bonus credits on Galactic Hot Dogs Island this weekend only! The second volume of the Galactic Hot Dogs saga is in bookstores now, and we're pretty pumped! It's an all-new adventure with even more laughs and action than the original. You can find out even more at the Galactic Hot Dogs page. To celebrate, we're giving away bonus credits to everyone who finishes Galactic Hot Dogs Island on Poptropica this weekend -- including those of you who have already finished it before! That's right: whether it's your first time through, or your 50th, you'll get bonus credits for completing Galactic Hot Dogs this weekend. If you've never finished this Island before, you'll get the 150 standard credits, plus 150 more! And if you have finished it before, you'll also get the bonus. Everybody wins! But this offer is only good until Monday morning, so don't wait around! Visit Poptropica now to play Galactic Hot Dogs Island, and earn 150 bonus credits!